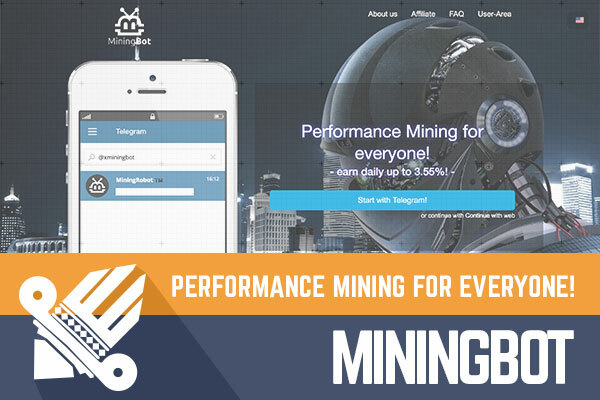 DavidNews HYIP blog - News & Reviews: MiningBot - Performance Mining for everyone! MiningBot - Performance Mining for everyone! An interesting project called MiningBot has joined Golden Stage on the DavidNews.com monitor on the 23rd of October. I find interesting AI and bots and website looks futuristic at first glance. Of course, it’s only a visual appeal and we need to dig deeper to find out about investment plans and features. This HYIP has been online in total for 17 days and is still a comparably young for a long-term HYIP investment. I made this assumption after taking a quick look at investment plans. Now I have reinvested in it 0.06 BTC and will keep you updated with the payment status in the next days and weeks, probably months… Keep reading to find out more about this project! First, I would like to begin with the most interesting feature of MiningBot. It’s a Telegram bot, which provides required information upon your requests. For example, first time opening a MiningBot HYIP on Telegram user can choose a preferred language for communication with a bot. There are 9 different language options available: English, German, Portuguese, Polish, Spanish, French, Chinese, Japanese and Russian. I would say that admin has chosen 9 largest language groups in the world. Once the language is chosen bots start communicating with the user in the chosen language and user must specify if it’s a new or existing account. All commands to MiningBot are sent typing a message or selecting one of the available options offered by MiningBot. Once the account is created user receives a secret key, which is required to access your account. Whenever the key is stored the user will see several menu options for making investments, making reinvestments, making withdrawals, accessing settings, partner program, and several other menu items. At first, I thought there are not enough features. However, after a while a realized that most of the HYIP’s have so many irrelevant functions. Therefore, MiningBot is a great example that less is better. There are not many functions, but you can find everything – referral links, account balance and two payment options – Bitcoin and AdvCash. By the way, your deposit will be displayed in BTC even if you make a deposit from AdvCash. As I already wrote, I like the idea of MiningBot. However, I had trouble accessing the Web version of MiningBot. I believe the admin had the intention to place it on the website because on the home page of this HYIP we see two calls to action – a button “Start with Telegram!” and a hyperlink – “Continue with web”. However, after clicking on the latter I was brought to a web page with header image same to the home page but right under the image, there is an icon with red exclamation mark. You can check if the error is still there once you access the website. Moreover, after reading forum conversation I noticed that other people had similar trouble. The website has DDoS protection from CloudFlare, SSL certificate assigned by Comodo. However, I don’t see the point of having such functions when investments are made through Telegram and the website has been built only for informative purposes like publishing a legend, providing FAQ’s, investment calculator etc. On the other hand, the website might look bad if compared to other HYIP websites with above-mentioned functions, which have become a standard lately. It’s time to move to most important topic – investment plans. First, the minimum investment is 0.001 BTC, but there is no maximum limit. Second, there are 3 different plans and % rates based on the amount of your investment. Small plan – min 0.001 BTC and 2.74% per day. Medium plan – min 0.50 BTC and 3.17% per day. Advance plan – min 3.00 BTC and 3.55%. You don’t have to be an expert to understand that only the first plan has affordable minimum deposit rate. Please use the BTC to USD currency converter to find out current rates. Third, minimum withdrawal is 0.005 BTC, which is very high minimum withdrawal. In my opinion, some experienced players wouldn’t be happy about such rate. Fourth, there is no maximum deposit term for any investment. Fifth, the initial deposit is not returned at the end of your investment term, because it is "piggy bank" project, and you must first reach the breakeven point. At the very beginning of this review, I called it a long-term HYIP because MiningBot rates for the most affordable plan is even below the 3%, which I find a long-term rate. Besides, the initial deposit is not returned at the end. For example, 0.03482687 BTC investment fits the first plan and would reach its break-even point only after 37 days and it would take another 37 days to earn the profit equal to the initial deposit. So, 74 days (2,5 month) is a long time and anything could happen. On the other hand, such HYIP’s have less risk of too many withdrawals at the time because initial deposits are not returned. Even though MiningBot looked very promising at the beginning, I noticed some disadvantages on the website. Telegram bot seemed to work fine. However, I’m eager to hear from you if all 9 language versions are human translated or they were made using Google Translate (or similar program). I think that positioning this project as Telegram only would be much better marketing approach. Instead, the web version is quite confusing with the bug after choosing “Continue with web”. In terms of investment plans, I already wrote my opinion – this is a HYIP with a long-term investment approach and comparably low rates. However, it’s not always a bad thing. In the meanwhile, plans look really promising and feature to withdraw deposit any time looks great. However, nobody will tell you when the admin will decide to close it. Therefore, if you ever decide to make any investments, don’t invest more than you can afford to lose! Any positive or negative experience to share about the MiningBot HYIP with our readers? Please drop a message in the chat box! Investment plans: 2.74% up to 3.55% daily for an unlimited term. Possibility to withdraw your initial deposit with 30% fee.